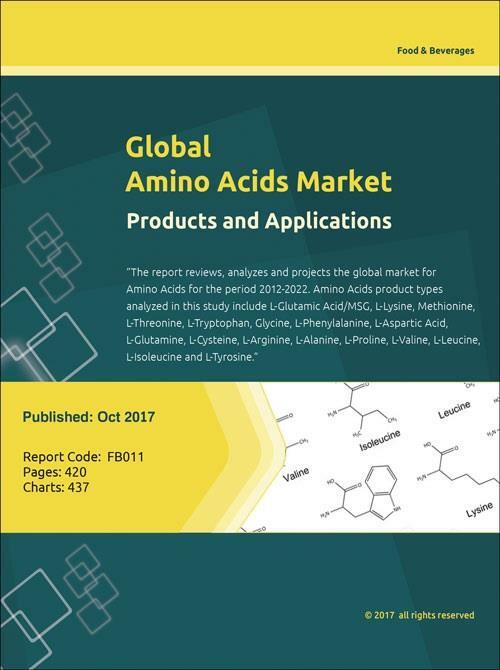 Worldwide demand for Amino Acids is expected to maintain a marginally faster market value CAGR, compared to volumes growth, of 5.6% over 2017-2022 and reach a projected US$25.6 billion by 2022 from an estimated US$19.5 billion in 2017. Animal Feed constitutes the largest, as also the fastest, growing application for Amino Acids globally, consumption value of which is slated to compound annually at 6.9% over 2017-2022 in reaching a projected US$10.4 billion by 2022. Asia-Pacific is the world’s largest market for Amino Acids, in terms of both volume and value and is estimated at US$9.6 billion in 2017, which is also likely to record the fastest 2017-2022 CAGRs of 6% in terms of market value and 5.5% in terms of volume consumption. Meanwhile, South America is projected to record the similar growth rates during the same analysis period at par with Asia-Pacific. Meihua Group Completes the Acquisition of NingXia Eppen Biotech Co. Ltd.
Fujian Maidan Biology Group Co. Ltd.
Baoding Mantong Fine Chemistry Co., Ltd.
CJ Haide (Ningbo) Biotech Co., Ltd.
CJ Shenyang Biotech Co., Ltd.
Chongqing Unisplendour Chemical Co., Ltd.
Henan HDF Chemical Company, Ltd.
Hubei Provincial Bafeng Pharmaceuticals & Chemicals Share Co., Ltd.
Livzon Group Fuzhou Fuxing Pharmaceutical Co., Ltd.
Shijiazhuang Zexing Amino Acid Co., Ltd.
Yantai Hengyuan Bioengineering Co. Ltd.